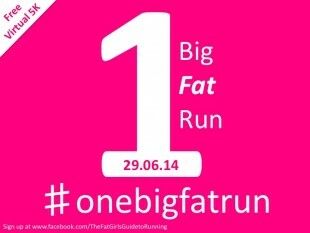 No it’s not a joke, it’s what happened yesterday as part of the first ever Fat Girl Run Clinic – a unique 1 day running retreat for plus sized runners. About a year ago I wondered if there was such a thing after looking into running retreats myself. I was too worried about my speed and fitness levels for mainstream courses and figured there had to be something out there for runners like me. So at 10am yesterday morning I met 19 excited (and nervous) women from all over the UK waiting patiently outside in the sun by West Ham tube station. I didn’t give them much time to stress any further though, quickly pairing them up and setting them off on their first challenge – to locate and get to Fat Girl Run Clinic HQ a short 20 minute stroll away, they had 15 minutes max and just some simple directions. All 19 made it to our meeting room in the allocated time, where they found refreshments and were issued their uniform for the day. After setting off the last two runners from West Ham and making my way back I entered the room and could hardly hear myself think over the hubbub. 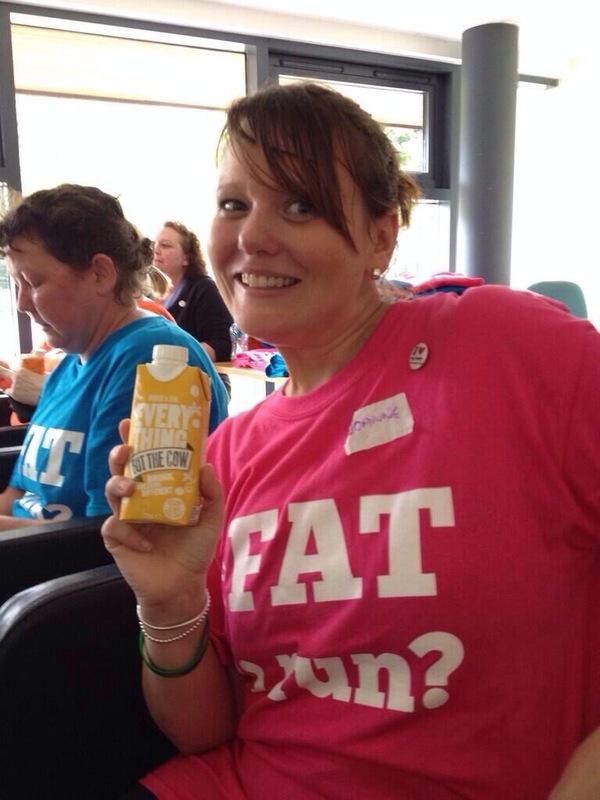 The Fat Girl Run Clinic was well and truly open for business!! What followed was a jammed pack day of information, sharing, and the facing of fears. 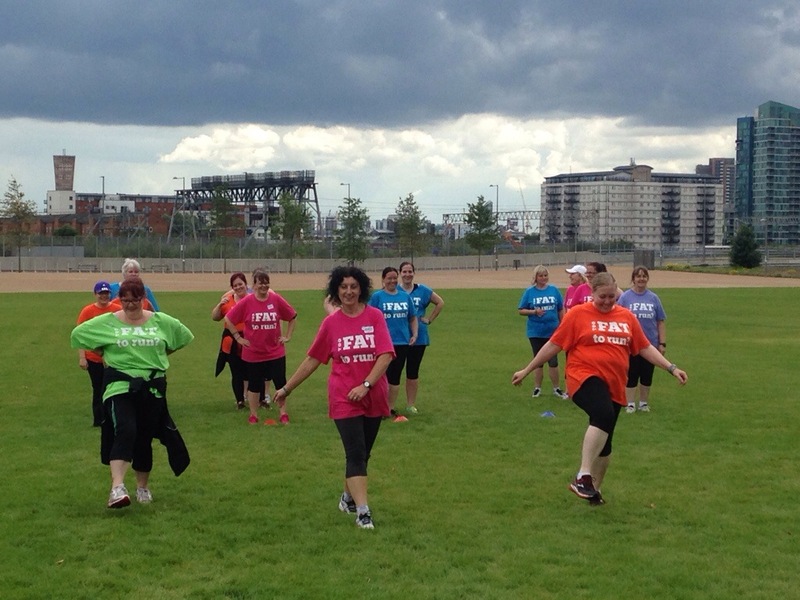 With a 45 minute run around the stunning Queen Elizabeth Olympic Park, a lovely pub lunch and then a speed session in the shadows of the stadium planned, what the ladies were not expecting was the thousands of young revellers making their way into the holi festival that was taking part in the park too this weekend. 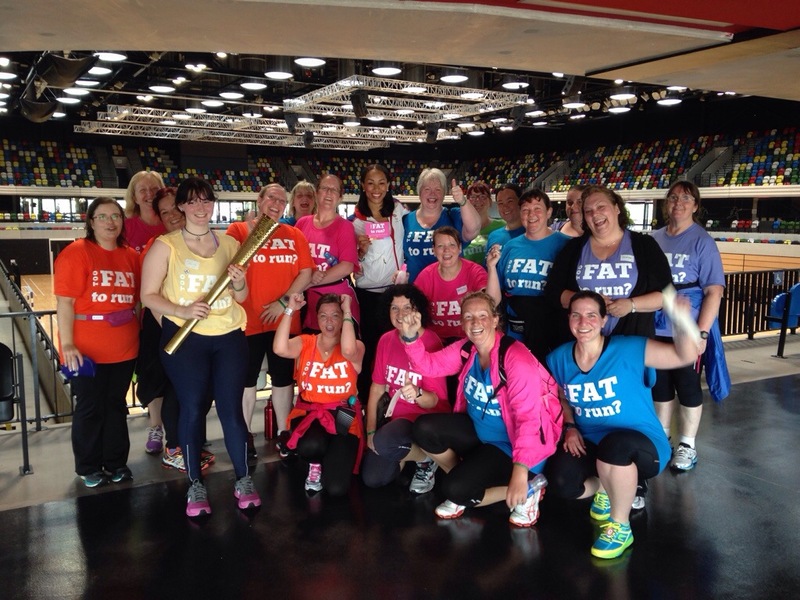 But rather than being the embarrassing experience this could have been the ladies told me they felt empowered running in their bright “Too Fat to Run” t-shirts in public and received loads of encouragement from the youngsters!! 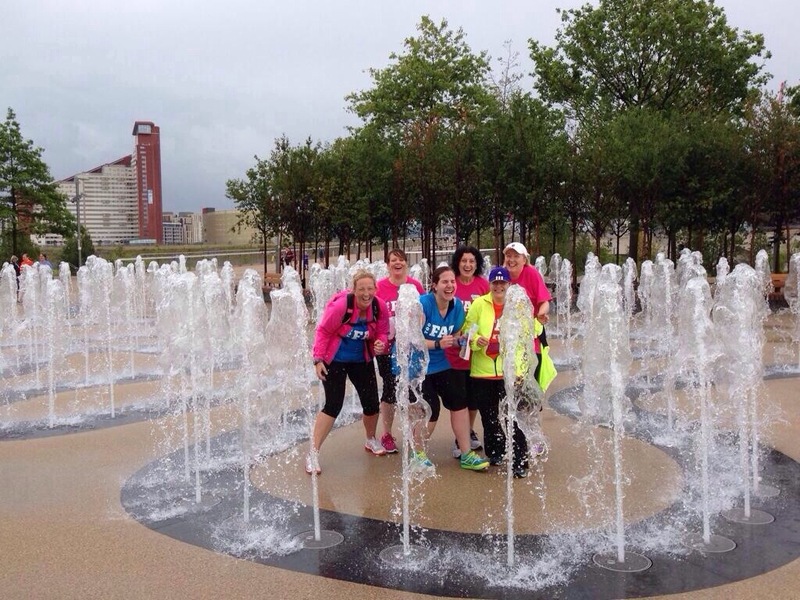 Working in 3 groups the ladies negotiated the vast area of the damp Queen Elizabeth Olympic Park which is a runners paradise with nice wide thoroughfares, hills and canal paths. 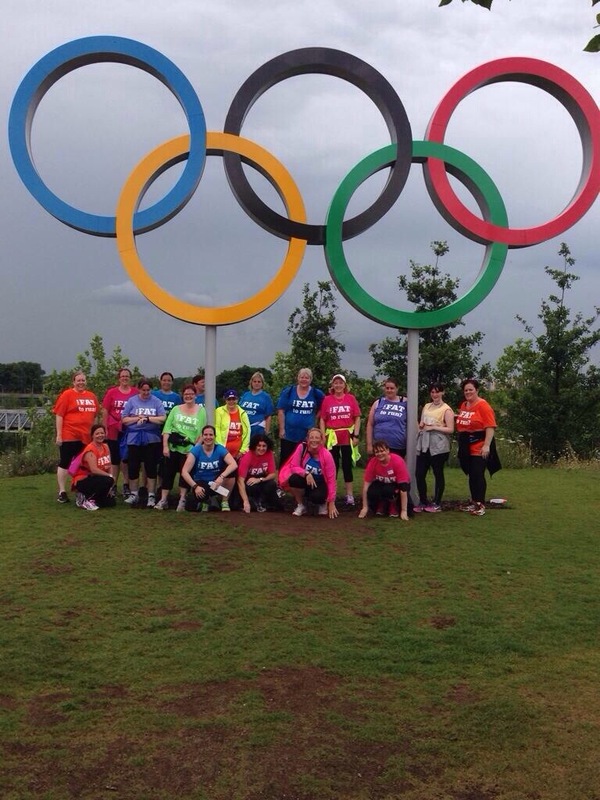 One group got lost, another had to wait patiently for the water fountains to come on and by the time we got close to the Velodrome all 3 groups congregated in time for a fab photo below the Olympic Ring Sculpture. We managed to get some support from a real athletic youngster too in the form of olympic long jumper Jade Johnson who posed for a picture with us when we popped into the Copper Box venue for a bit of a nosey! Jade was impressed with what the ladies had already managed and thought the whole “Too Fat to Run?” concept was a great one. Today was all about facing fears, but also about being visible and changing the hearts and minds of others. We certainly got some attention wherever we went, especially as we headed into a crowded pub for lunch. We had a table reserved upstairs and lunch was a scrummy but healthy affair and a chance for us all to have a natter about our lives and our running experiences. By the time we left the pub it felt like we were a unit and as I paired the ladies up into two files and led them on a steady jog past the aquatics centre back into the South Park people stopped and stared at the site of us, and not in a freakish “Look at that” kind of way, but a wow look at them go, and as the faster ladies took turns to drop back and catch up again ensuring we remained as a group it was clear that every single one of these ladies understood how it feels to be left behind. The afternoon session took place on a nice soft grass area next to the Olympic Stadium where Mo Farah did his thing in 2012. With a range of games, and technique based relays the focus was simply on rediscovering the joy of running and finding your internal gearbox which allows you to shift things up a notch in terms of speed. We had the perfect recovery drink waiting for us back at HQ, an ice cold Everything But the Cow – a delicious and nutritious new soya protein shake made with real fruit. Not only did the ladies love the taste the unique blend of 7g NON GMO soya protein and 20% real fruit, with just a hint of honey was great for post workout repair but is equally just a great healthy drink choice. We finished the day off with a Big Fat Stupid Goal setting session, getting to the bottom of what holds us back from reaching our goals. sometimes you just need to plant a seed and then stand back, and it most definitely worked for one lady who announced “I am going to run the London Marathon next year” after saying just 3 weeks ago that she would never be able to do so. After a final task of sharing what one thing each lady would be doing as a result of the workshop, they excitedly received their goodie bag and were sent on their way, back to their own lives to implement what they had learned. The whole day was absolutely phenomenal from my perspective. It was everything I dreamed it would be and more. I pretty much collapsed into my bed shortly after, I guess I had been running on adrenaline in the days leading up to it and needed some sleep. Today though now that I am well rested, I have been deconstructing it all in my mind, looking at all the updates on social media from the ladies and reading the feedback they kindly left me on postcards after the session. There you have it, from the ladies themselves. I would just like to say massive thank you to those 19 amazing ladies who took a punt on this as the first ever attendees!! Seriously? Chesterfield Derbyshire??? ROLL ON PAY DAY!!!! Ohmigosh wish I could sign up NOW!!! We’ve booked. Caroline and me from http://www.fat2fitbitch.com. We’ve already lost 10 stone between us through running, hard work and determination. Still have another human to go. Can’t wait to see you there.